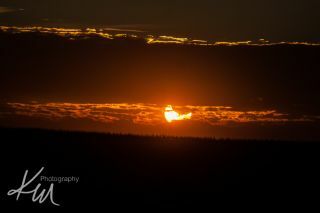 Photographer Kali Morgan captured this photo of a partial solar eclipse over Illinois on Oct. 23, 2014. A partial solar eclipse will darken the skies above southern Africa early Sunday (Sept. 13), and the entire world can watch the spectacle live online. Sunday's eclipse will be visible to observers throughout South Africa, as well as people in the southern parts of Mozambique, Zambia, Zimbabwe and Madagascar. But wherever you are, you can view the eclipse live thanks to a free webcast hosted by the Slooh Community Observatory. The Slooh show begins at 12:30 a.m. EDT (0430 GMT) Sunday and can be viewed live on Slooh.com along with the observatory's archive of night sky webcasts. It will run through 5 a.m. EDT (0900 GMT), with the time of maximum eclipse expected at 3 a.m. EDT (0700 GMT). The best time for Sunday's partial solar eclipse comes at 2:54 a.m. EDT (0654 GMT), when the moon will cover 79 percent of the sun's diameter as seen from one spot in Antarctica. But viewers in populated areas won't see such a dramatic effect. For example, NASA eclipse expert Fred Espenak calculates that, above the South African city of Cape Town, the moon will blot out a maximum of 30 percent of the solar disk. In Cape Town, incidentally, the eclipse will begin as the sun and moon are rising at 6:49 a.m. local time (12:49 a.m. EDT; 0449 GMT), reach its maximum extent at 7:43 a.m. local time and end at 8:49 a.m. For more information about timing in other parts of Africa, consult Espenak's eclipse site. Warning: Never look directly at the sun without adequate eye protection, even during an eclipse; serious and permanent eye damage can result. You can buy special solar filters, or a No. 14 welder's glass, which is available from welding shops. Alternatively, you can view solar eclipses indirectly by building a simple pinhole camera. Solar eclipses occur when the Earth, moon and sun align, with the moon in the middle. When Earth's satellite blocks out the entire solar disk, a total eclipse results; when the moon just takes out a bite, it's a partial solar eclipse. That total solar eclipses can occur at all is a strange accident of cosmic geometry. The sun is about 400 times wider than the moon, but it's also 400 times farther from Earth, so the two objects are roughly the same size in Earth's sky. "During a total solar eclipse, the moon is a near-perfect fit for the sun's disk, so almost all of the corona is visible," Jack Ireland, a solar physicist at NASA’s Goddard Space Flight Center in Greenbelt, Maryland, said in a statement. The corona is the sun's thin atmosphere, which is ordinarily tough to observe because it gets lost in the overwhelming glare coming from the solar surface. A total solar eclipse will be visible to many skywatchers in the United States on Aug. 21, 2017. The "path of totality" on that day will be a band about 100 miles (160 kilometers) wide that stretches diagonally across the country from Nashville, Tennessee, to Salem, Oregon. The August 2017 solar eclipse will mark the first time a total solar eclipse has been visible from the contiguous United States since February 1979, NASA officials said. A total lunar eclipse will follow Sunday's event by two weeks. On Sept. 27, the moon will pass completely into Earth's shadow, in a spectacle visible to observers throughout North America, South America, Europe, Africa and the Middle East. This event will occur when the full moon is closest to Earth in its elliptical path around the planet, so the occurrence has been dubbed a "supermoon total lunar eclipse." Editor's note: If you capture a photo of the partially eclipsed sun or any other sky sight, you can send images and comments for possible use in a future story or gallery to managing editor Tariq Malik at: spacephotos@space.com.